In the pilot for "Stargate: Atlantis", the Wraith Queen's dinner table has what appears to be the head of a Mastadge for a centerpiece. 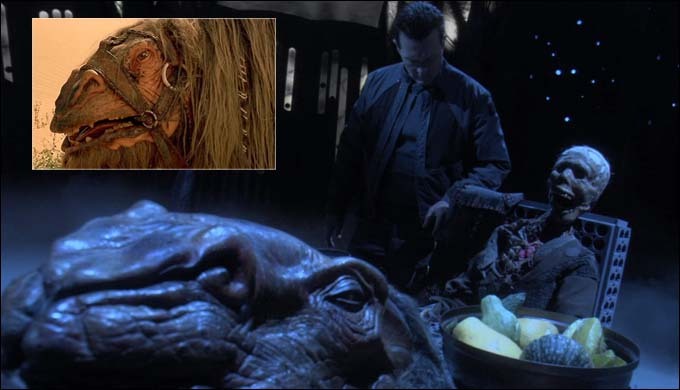 The creature appeared in the 1994 movie "Stargate" (it was the large beast that took a liking to Daniel), but didn't otherwise appear in the series. However, the creature was seen on Abydos, which is located in the Milky Way galaxy... a galaxy that the Wraith have no knowledge of at this point. This is probably just a tip of the hat to the film that started it all, but it also makes me wonder what the Wraith Queen is doing with an animal that's indigenous to a world they can't reach. Is the Mastadge head merely a nod to the original movie, or can this animal also be found in the Pegasus galaxy? Browse other questions tagged stargate stargate-atlantis or ask your own question. What are the abilities of the Pegasus Galaxy's species, the Wraith? What Was the Rationale of the Ancients for Eliminating Manual Dialing of Pegasus Stargates?